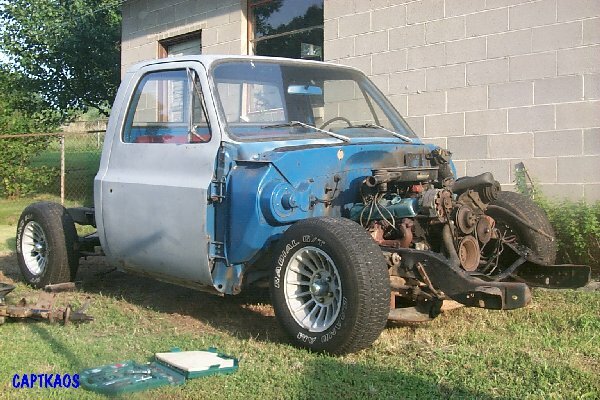 This is the bagged truck that I have been distracted on for the last few months. Finally got the pictures on the Impala SS wheels mounted on the truck scanned in and posted. Stealing an idea and basically his page (thanks Troy) this is the timeline to keep track of my progress. Newest entries are first. Aug 7, 2001: Bent the rear half of the supply and return lines that go from the Blazer tank to the Hilborn unit. Currently they are just placed in the frame waiting for the engine/trans to be put in and finished routing. July 25, 2001: Recieved the tubing bender from Eastwood Co. and started practicing using it on some fuel line. Sanded the motor mounts down getting ready to paint them. July 16, 2001: It has been a while since the site has been updated, but I have finally gotten some work done on it lately. Today I installed the pitman arm on the AGR box and mounted it on the frame. I also sanded on the front brake lines to get them ready to be painted. I mounted the braided brake lines that were purchased from Inline Tube Pictures of them will be up soon after I get the A-arm mounts installed. 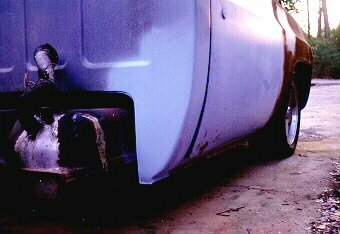 July 7 2001: Painted the pitman arm, and the bag brackets that I built for my distracting "other" project, the bagged truck. 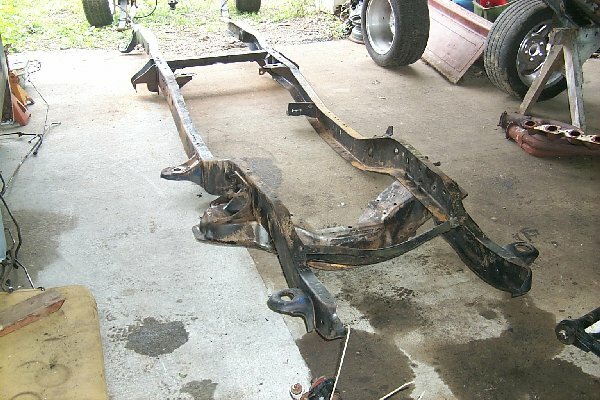 June 25, 2001: Ordered some tubing benders from Eastwood Company So I can finally get the fuel lines ran down the frame. December 9, 2000: Moved the project truck to my garage out of the cold. 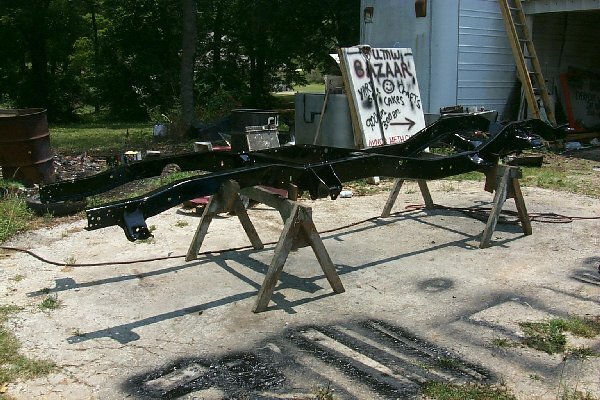 November 25, 2000: Started bending the fuel lines to fit the frame. November 18, 2000: Recieved the fuel lines from GM. October 31, 2000: Installed the new disc/disc prop valve from Classic Performance and reinstalled all but one brake line. Need to order the stainless braided lines now. October 30, 2000: Borrowed a double flare tool from my brother so I could get the brake lines back on. Got all the lines flared, had to repaint a few. October 28, 2000: "Stole" the missing brakeline nut from a "donor" truck. October 23, 2000: Sourced all necessary brakeline nuts except for one. October 22, 2000: Removed the front section of brakelines from the proportioning valve and removed the nuts that were rounded off. October 15, 2000: Cleaned and painted the rest of the brake lines. October 14, 2000: Cleaned and painted the part of the brake lines. September 20, 2000: Re-installed the blazer tank. September 19, 2000: Installed the front suspension components: lower control arms, and springs. Installed the steering components. Other than the front shocks, the suspension is done. 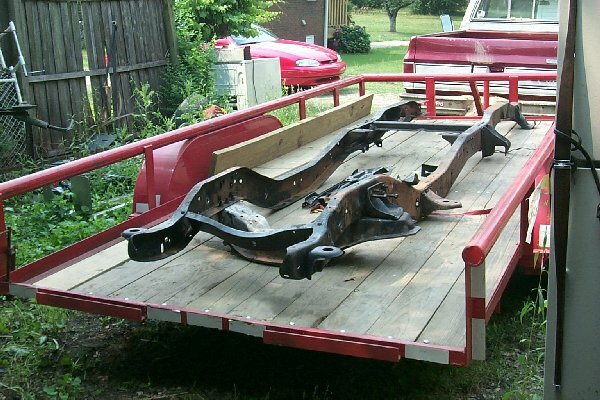 September 18, 2000: Bought new u-bolts and spring eye bolts and installed the rear differential. 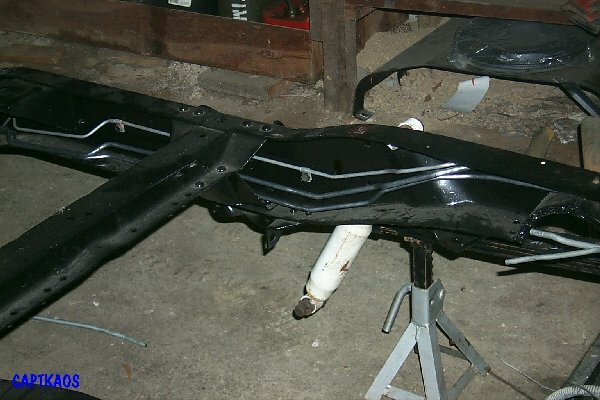 September 17, 2000: Painted the lower control arms. September 16, 2000: Finished prepping the steering components and control arms and painted the steering components and the rear spring pads. 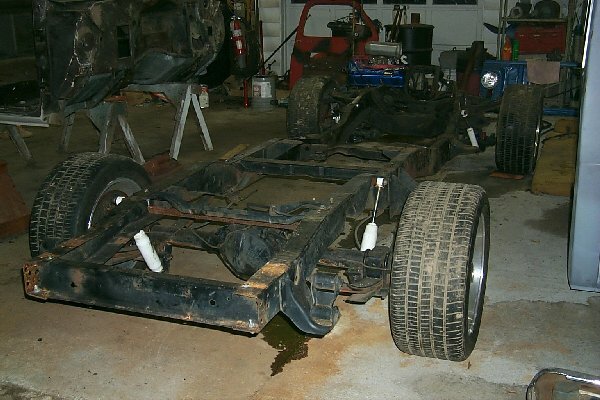 September 11, 2000: Pulled the steering components back off and stripped them. They are ready to be POR15'd. Also uploaded a new entry pick designed by Chris Hinkley. Thanks Chris. 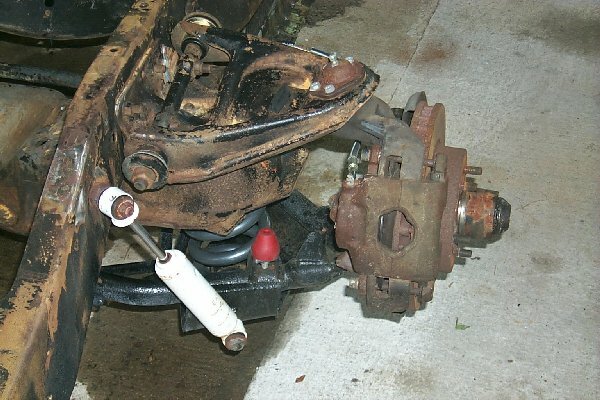 September 7, 2000: Finished stripped the lower control arms, started on rear differential mounts. 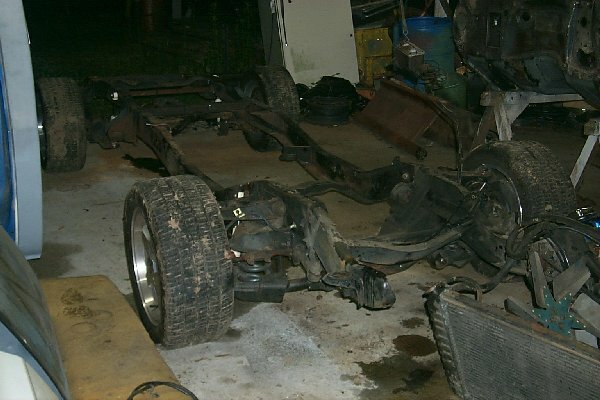 August 29, 2000: Pulled the front lower control arms off and stripped them. Getting ready to POR15 them. 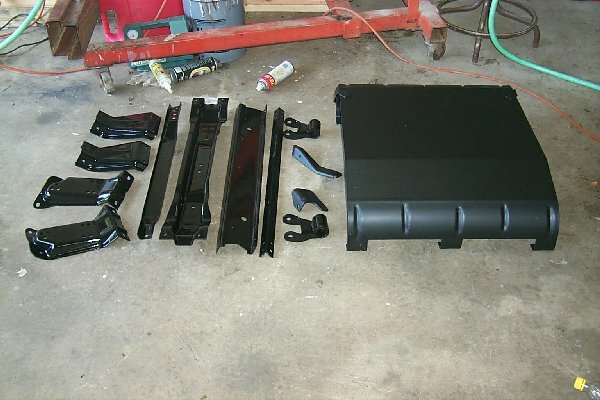 August 26, 2000: We finished the work on my tailgate, for the most part. I am going to get a 3rd brakelight installed and then finish up the back side. August 21, 2000: Helped a friend work on my tailgate, actually, I just supervised and he did the work. August 7, 2000: Went and picked up the Hilborn tonight. Conversion is completed. Now I need the sensors and the ECU. August 3, 2000: Anti-sqeak kit came in from LMC Trucks. July 28, 2000: FINALLY got the correct bushing set after sending them back 3 times. Installed the rear springs and the shackles. 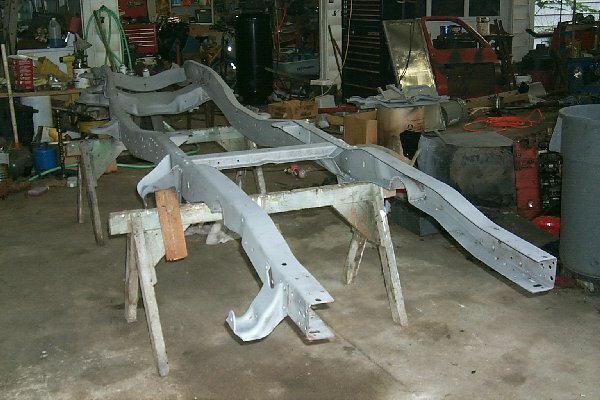 July 27, 2000: Started cleaning on the axle mounting plates preparing them for painting. July 25, 2000: Recived supposedly the correct shackle bushings, wrong insert sleave size, new ones should be here this week. July 24, 2000: Ordered anti-squeak kit from LMC Truck. Should be here by next week. July 22, 2000: Made a little more progress on the "special" project. 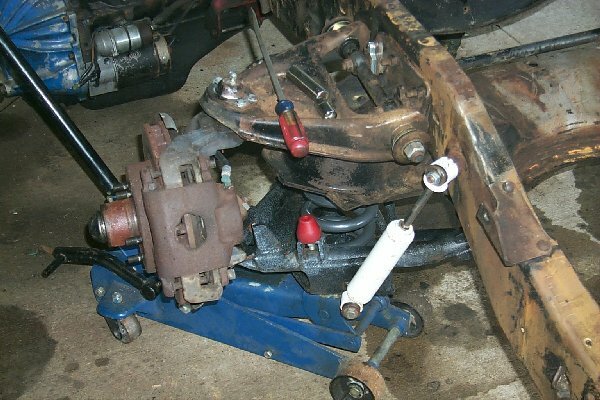 July 5, 2000: Installed all the frame crossmembers back in and installed the bushing in the new leaf springs. The shackle bushing is still too loose, so I am sending it in for an exchange. 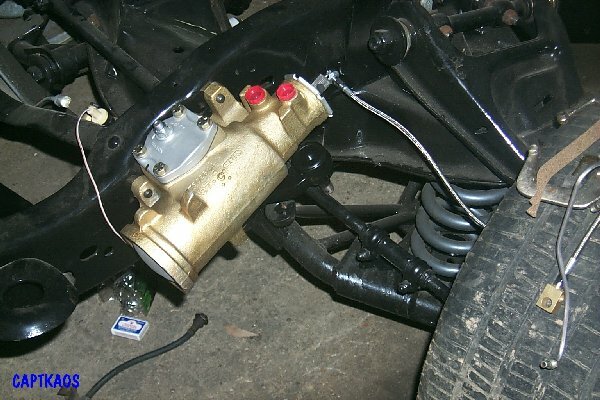 July 3, 2000: Finished the assembly of the front suspension. 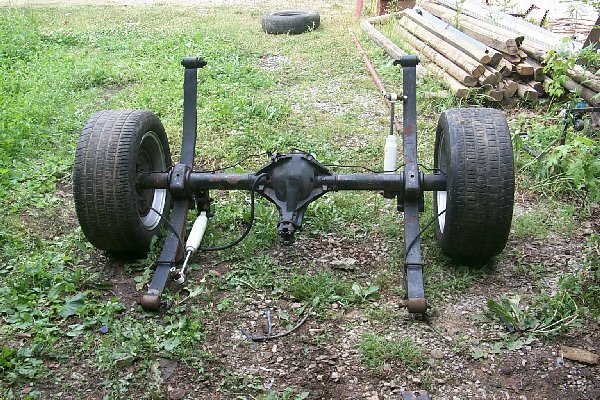 July 2, 2000: Started the assembly of the front suspension. 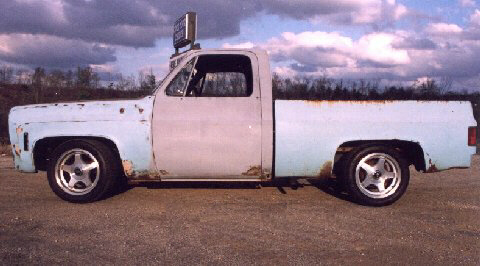 June 17, 2000: Finished stripping the bottom of the cab and FINALLY painted it. (I will never do that again.) Got the POR-15 on and the enamel on. Cleaned on the upper control arms and the gas tank more. June 16, 2000: Started stripping/cleaning the gastank for POR-15 application. Stripped more of the bottom of the Cab. June 15, 2000: Shipped incorrect suspension bushing back to PST for an exchange. June 14, 2000: Ordered 6" dropped springs with lower rate from Chisholm Enterprises. 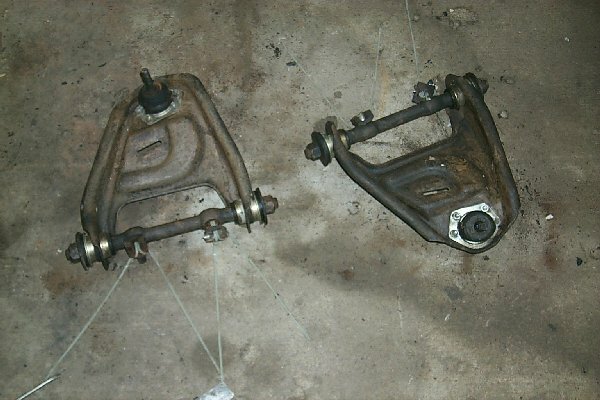 June 13, 2000: Removed the upper control arms from the front suspension assembly and started cleaning them for the POR-15 application. June 11, 2000: Moved frame back under shed out of the way. June 02, 2000: Went and picked up the Doug Nash 5 speed I purchased on May 24. Muncie M22 is now officially SOLD! 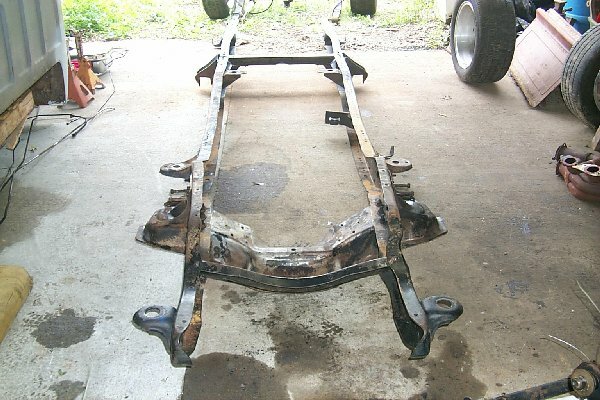 May 21, 2000: Dissassembled the Malibu bumper to get it sandblasted. 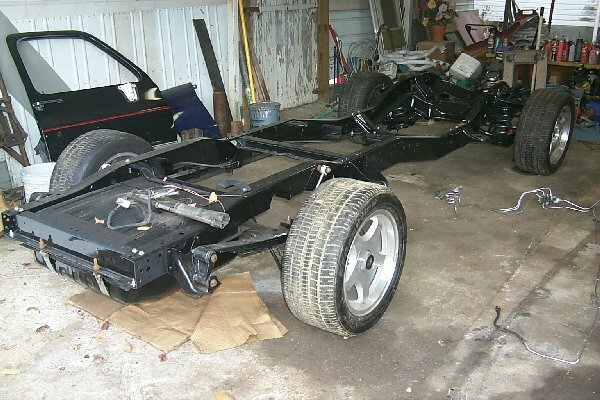 May 15, 2000: Pulled the motor mounts attached to the frame off. Pull the brake system off and the fuel lines off. 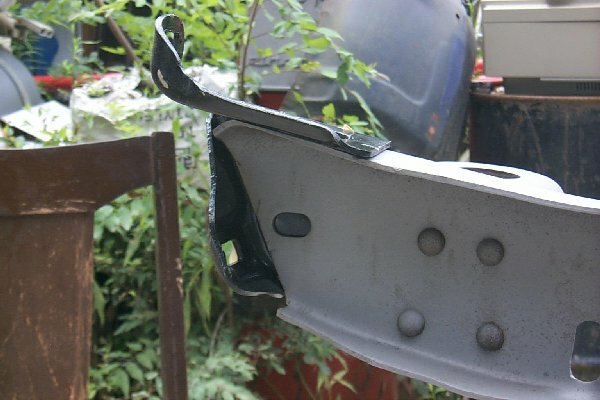 May 10, 2000: Finished removing the exhaust system, and removed all bolted bracketry. Pulled the emergency brake components off. May 9, 2000: Stripped more off the bottom of cab. Finished removing the exhaust system. May 4, 2000: STILL stripping the bottom of cab. Thinking sandblaster. 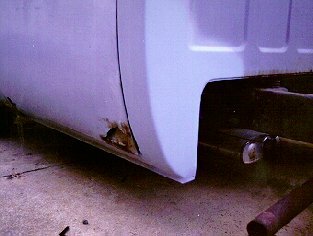 May 2, 2000: Finised removing most unwanted brakets from frame. Started on stripping the bottom of cab. 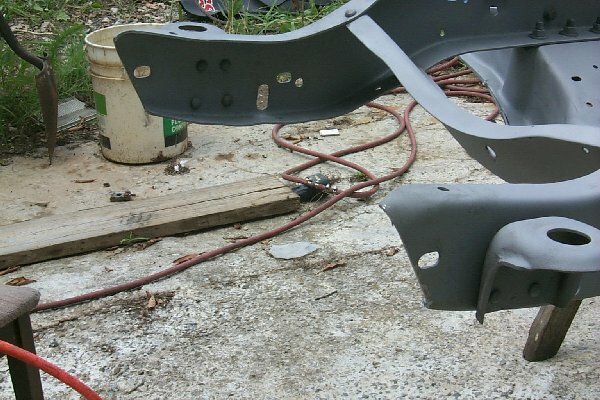 April 29, 2000: Purchased a '81-82 paintable front bumper. April 25, 2000: Mounted the support for the rear gastank strap. 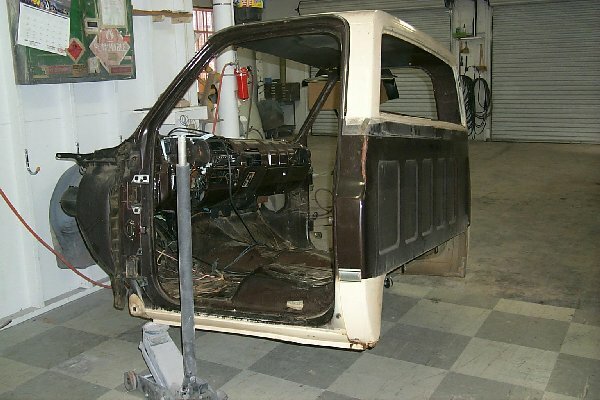 April 21, 2000: Sanded the door jambs and the rest of the exterior portion of the cab that was not sanded. April 18, 2000: Used the old frame supports that we removed originally, which worked out WELL, and bolted the crossmembers back in. BIG THANKS to my best friend Patrick Foster who has given me more help and support than he knows. Strap mounts will be next, and then we will attempt to use the skid plate. Talked with Force-EFI about the Haltech E6GM computer, they said it would control the Hilborn. Checking on prices now. 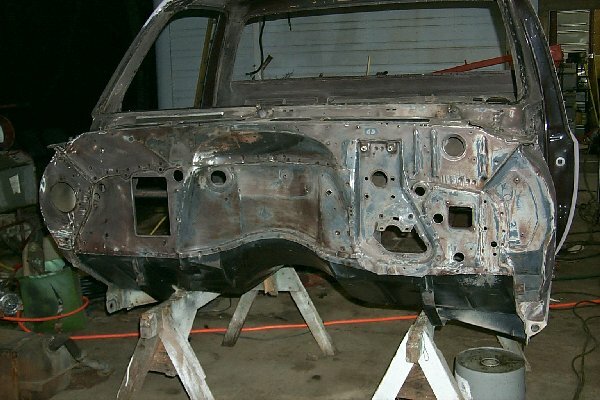 April 16, 2000: Finished sanding on the firewall and started on the rest of the body. Still not finished the interior roof. Started on the Blazer Tank mounting. FINALLY!! April 15, 2000: Worked on the "special project. Coming along VERY well. Might rap it up in a few weeks. April 14, 2000: Recieved the distribution block from Jim's Performance today. April 12, 2000: Shop converting Hilborn has put me on delay again. Next week now. April 9, 2000: Called Jim's Performance and ordered the distribution block from him. April 6, 2000: Worked on the "special" project again. April 5, 2000: Got started again on the "special" project. Talked to Jim at Jim's Performance about ordering a distribution block for the Hilborn MAP sensor. Should be ready to order on Friday. Talked with the shop welding the injector bungs, rails and TPS for the Hilborn. Says he should have it done next week. April 1, 2000: Sanded on the outside of the Cab more. March 29, 2000: Sanded on the Cab more. Completed most of the inside (minus roof) and started on the outside. March 26, 2000: Finished sanding the dash, and started sanding on the interior of the cab. March 25, 2000: Sanded on the dash. 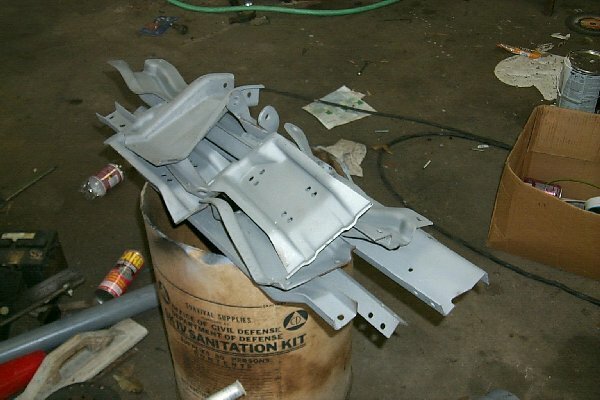 March 24, 2000: Recieved battery tray from Performance Bodies Started sanding on the dash. March 18, 2000: Spent most of the evening cleaning off the bottom of the cab. Remarketably there is only a few minor rust spots. It is ready to be painted with Por15. Tailgate frabrication is finished. March 17, 2000: Removed the A/C box from the firewall and removed all the undercoating off. It is ready to sand now. 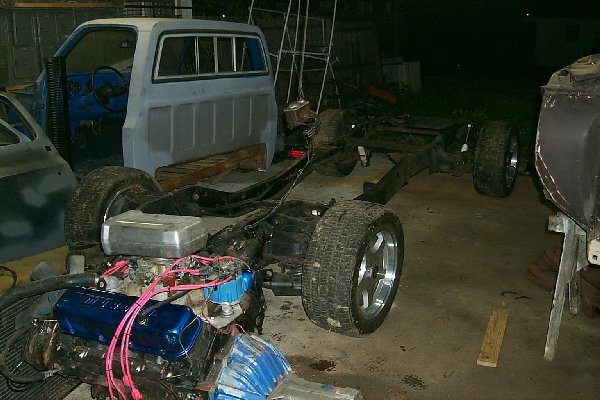 March 15, 2000: Took the Hilborn to the shop to get the injector bungs and fuel rails made up. Checking on adding the IAC motor for better drivability. 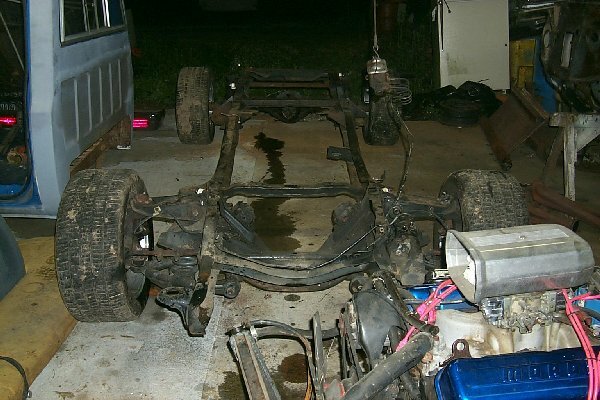 March 14, 2000: Took the Hilborn apart to clean it up and to take it to the shop for pricing. March 13, 2000: Removed all the rubberized coating from the firewall to get ready to start sanding. 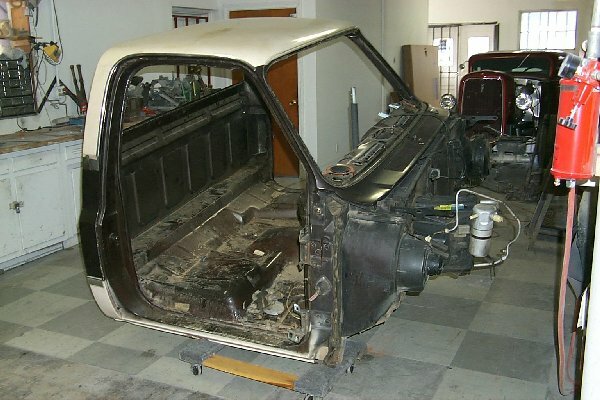 March 12, 2000: Stripped the new cab of all of its interior parts and exterior parts minus the A/C box. Washed down the interior to remove the accumulated dirt in all corners. Getting it ready for painting. 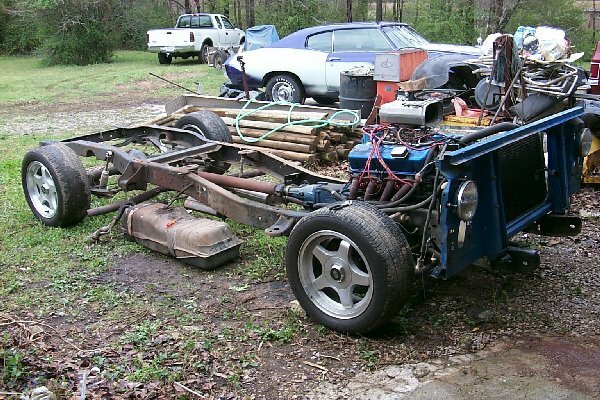 March 11, 2000: Pulled old cab off and pressure washed the frame. Picked up a '86 Blazer gas tank with skid plate and electric fuel pump. (Blazer Tank Pic) Went and picked up the Cab from the body shop. 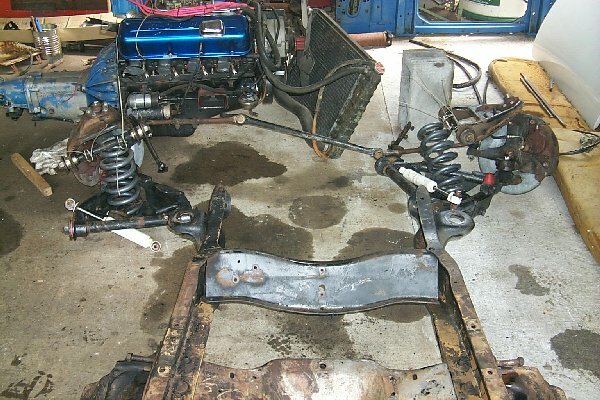 March 7, 2000: Pulled all the wiring, hoses, shifter, and necessary pieces connected to the old cab off to get ready for the new cab. Should pull the cab off this week. Pics of the bare frame will follow. (worked a little more on "special" project also) (Bare Frame Pic). March 6, 2000: Went to check on the places I wanted my bodyman to fix on the cab. Seems he got a little carried away. Instead of fixing 2 places, he is doing the WHOLE cab! Oh well, should be done by Wednesday the 8th. (Fixed Cab Pic). March 3, 2000: Hilborn Injection unit has arrived! Chased the UPS man down to obtain it. A pic of it can be seen at the top of the page. March 2, 2000: Called a company close by that was recommended by a friend that owns a Turbo shop to check on the price for the conversion. 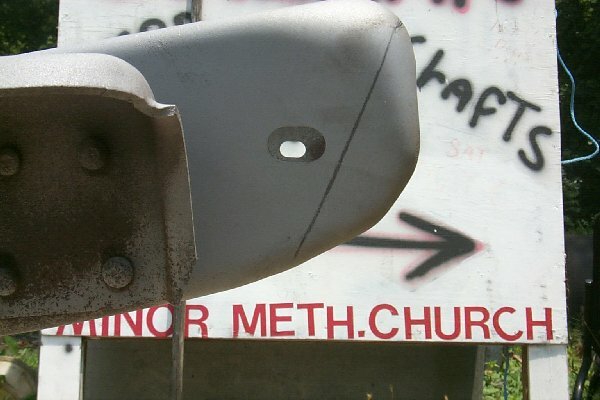 This conversion will be documented on the web when it gets underway. 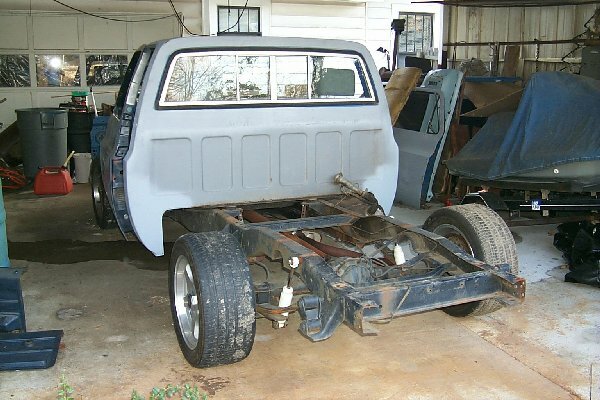 March 1, 2000: Started cutting out some of the key rust areas of the truck. 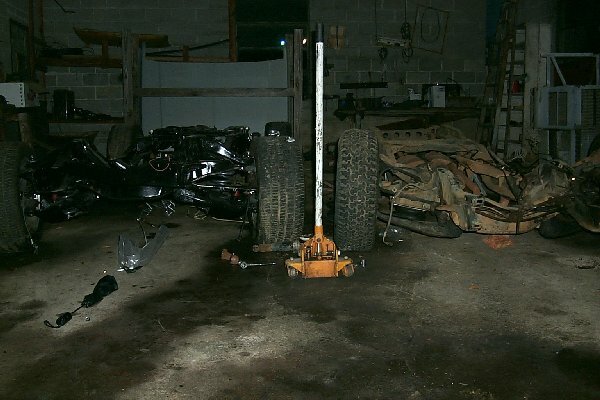 Took some new pics of the truck torn down to its current state. Look above for the links. Got the tracking number for the Hilborn. 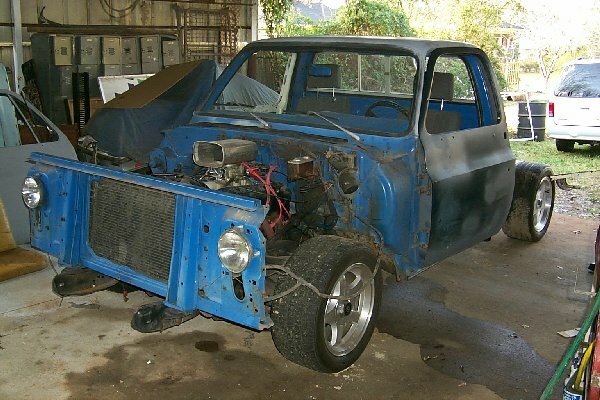 February 27, 2000: Started the 73-87 Chevy/GMC C/K Trucks Webring, click to sign up. February 23, 2000: Purchased a Hilborn Injection system for the BBC. Going to be converting it for DFI. 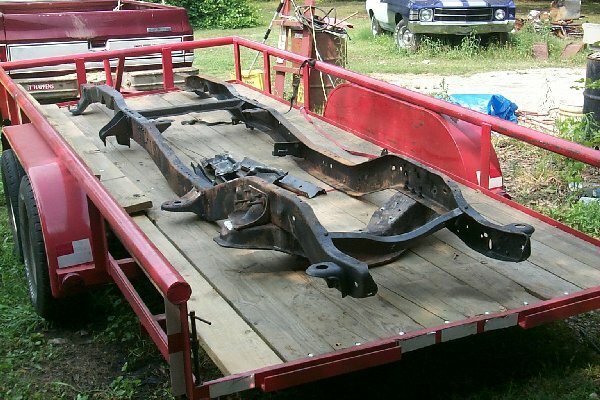 February 19, 2000: After cleaning up a friend covered carport for 3 days and earning the right to put/leave my truck there for a while, I took it to his house for disassembly. January 16, 2000: Bought gear oil for the trans and got it put in. Then removed the bed for the cab corner work. (Bed Removed) Hopefully it will be fixed this coming week. My bodyman is having a slow week. 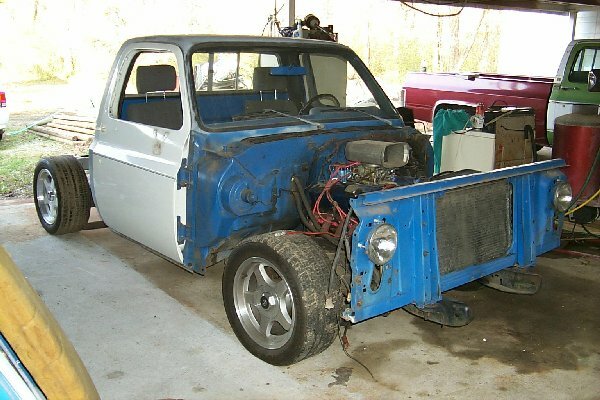 January 15, 2000: Spent 2 and a half hours putting the side cover back on the M22. DO NOT do this unless you take it out. Much easier process when the trans is out of the vehicle. January 11, 2000: Under the impression of a buyer for my M22, I pulled the side cover off for pictures (the trans is still in the truck). Unfortunately he wasn't as sure as he was earlier in the day. Needless to say it got dark and it is not back together. Guess it will be my weekend project. January 10, 2000: Posted the pics of the truck on the website I scanned. They are the truck with Impala SS wheels, the interior w/ bucket seats, and the engine. If you have any questions,comments or suggestions email me...captkaos@charter.net COPYRIGHT NOTICE. Copyright © 1988 Chris G. Lucas. All rights reserved. Product and company names mentioned herein may be the trademarks of their respective owners. Any rights not expressly granted herein are reserved. ALL drawn images are copywritten by the owner of this site. Duplication and distribution is not allowed inless given permisson by owner.